If buildings could speak, we would probably all be long dead before the Tower of London finished telling the story of its life. Spanning over a millennium, the White Tower was the first true castle built in England, first in wood and subsequently in stone. The host of characters and the monumental events housed within its walls represent the history of England itself, dominating London and the medieval world in often unbelievable and unspeakable ways. Now one of the most famous tourist attractions in the world, the Tower stands witness to the distant past. 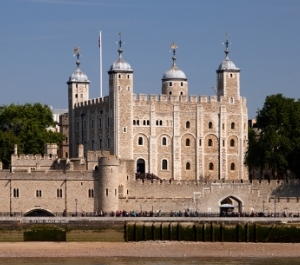 During its long and eventful life, the Tower has been a zoo, a royal residence, a fortress, a prison, a torture chamber, a political arena, and a tourist trap. And since the Tower cannot speak for itself, Nigel Jones has stepped in as its biographer to tell its fascinating and gruesome tales. Tower is widely researched and is admirable for the breadth of information it covers. We learn of the White Tower's creation in the 1000's by William the Conqueror and his architect, Gundulf the Wailing Monk (a very emotional man, it appears), and all the subsequent additions made by later kings. We learn of the Tower's changing role throughout its lifetime, and about many of the famous people who stayed there (both willingly and unwillingly) and those who died there (all unwillingly). We see the Tower's suicides, its royal births, its murdered kings, its famous lodgers, its tortures, and its bloody executions. In a conversational and generally entertaining manner, Jones tells 1000 years of England's history through the lens and backdrop of the Tower of London. However, though the story of the Tower is often thrilling, Jones' writing is often less so. I found the book slightly disorienting because of the way it was structured and organized. Sometimes it is a chronological story of the Tower and its events, and at other times it's separated by theme, so the book and its anecdotes constantly jump around in time without a connecting narrative. Although Jones includes specific information on the building itself and its timeline, a large portion of the book is about major figures and events in history just because at some point they were related to the Tower. For example, he spends chapters talking about the Wars of the Roses in the 1400's, providing many details about particular battles and leading figures, and the causes and outcomes of the conflict, even though very little of it actually happened at the Tower. At times this felt like Jones was just trying to fill space. I mean, I'm happy to know that Walter Ralegh's wife kept his embalmed head in a velvet bag for years and that King James I loved to step inside freshly killed stag entrails, but I don't really see what that has to do with the Tower of London. The White Tower, in the Tower of London. My favorite parts of this book were its random anecdotes, and Jones does present these in a fun if slightly disorganized way. There was the polar bear who lived at the Tower in the 1200's who fished in the Thames while on a leash because no one could afford the amount of fish it took to feed him. There was Sir Isaac Newton, the famous mathematician and physicist in the 1600's, engaged in an obsessive Sherlock Holmes-like search for his arch-nemesis, a notorious forger, while Newton was Warden of the Mint. There is a whole chapter on great escapes from the Tower of London which is very enjoyable, involving medieval cross-dressing, invisible ink made of orange juice, and even people who made straw dummies of themselves to try to fool their guards. Many of these stories were new to me and I loved learning about them. My biggest issue with this book (and for me, this was a huge one!) is that partway through I lost confidence in Jones' historical credibility. It all started when he asserted that King Henry VIII had Cushing's syndrome and that he became infatuated with Anne Boleyn when she was a teenager. Just because I happen to read a great deal about Henry VIII, this did not ring true to me. After double-checking the sources, I confirmed that while Cushing's syndrome is a possible explanation for some of Henry's symptoms, there is absolutely no physical evidence that he had it, it is just a theory (something Jones admits in the next chapter, though at first presentation it is stated as truth). Similarly, the exact year of Anne Boleyn's birth is unknown, but given the likely date range the youngest she could possibly have been when she and Henry got together was 19, and she may have been as old as 25. When I started fact-checking Jones, I found that he often presents alleged rumors and propaganda as statements of fact, without discussing sources or bias, which is very disturbing to me in a historical work. Also, he literally calls Henry VIII a "rotting hulk of flesh", a "monster of selfishness", and a "murderous monster". I get that historians can have their own opinions on historical figures. But using such dramatic and subjective language in a book comprised of short blurbs about people that are not backed up just seems irresponsible to me. Especially when Thomas More is described as "saintly" in opposition to Henry. The medieval world as seen by Jones is very black and white, very two-dimensional, which I found disappointing. Don't even get me started on what he says about Richard III. Overall, I found Tower entertaining and well worth the read. The last thousand years of English history is fascinating and many of the highlights are captured in this book, as they relate to the Tower of London. Despite my issues with Jones' writing and the fact that some of what he says should be taken with a grain of salt, the book contains a vast amount of information that is portrayed very engagingly, and I enjoyed reading it. 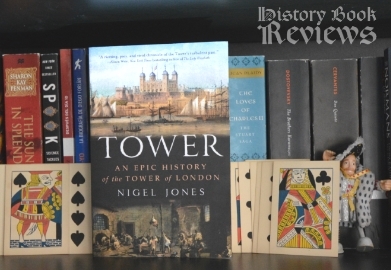 Jones gives a good sense of the Tower's continuity and importance both as a living remnant of the past and as a vital part of our present, and why, after 1000 years, it continues to be relevant and to captivate the minds of people worldwide. But beware, this book will make you want to buy a plane ticket to go see the Tower for yourself! This review appeared in an issue of Medievalist.net's magazine earlier this year. If you haven't visited Medievalists.Net, you're missing out!!! From their website: "History is often interpreted as something that happened a long time ago: a stagnant, unmoving moment in time that has little to no impact on our busy modern lives. Yet historians, archaeologists, and scholars are making new discoveries about the past every day, and our shared past serves as the theme for countless movies, novels, and games. History is a living, breathing entity that is constantly changing, moving, and happening all around us. Medievalists.net offers readers the chance to learn and experience what is new in history by providing comprehensive coverage of news, books, articles, games, movies, pop culture and more."